If you've got a weakness for coconut -- the tropical fruit that adds so much flavor to German chocolate icing, coconut cake and Thai coconut curry -- you might wonder if it's good or bad for you. The fact is, nutritional facts about coconut can be confusing. Often used in high-fat desserts and rich sauces, coconut can seem like a dietary indulgence, racking up a high number on your calorie counter. But that doesn't mean coconut is always a diet disaster. Coconut has been cultivated around the world for thousands of years. According to Dr. Thomas Ombrello of the Union County College Biology Department, roughly 17 billion coconuts are harvested every year across the globe. 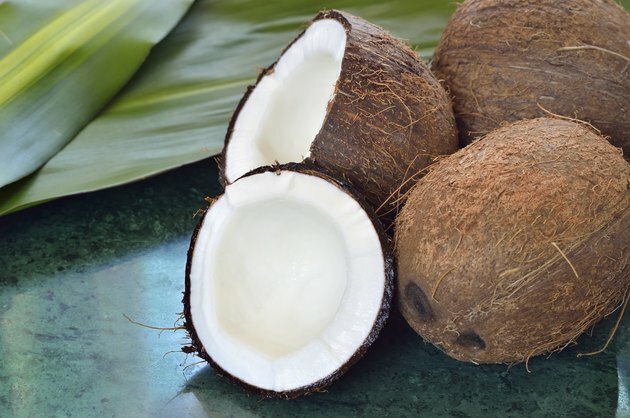 Coconut is used raw in candies and other sweets; its oil is used for baking and cooking as well as in various non-food products such as paint and soap; its milk is used for cooking; and the water from young coconuts is consumed as a high-nutrient health drink. There's no denying that coconut is very high in fat. The U.S. Department of Agriculture states that 1 cup of raw coconut contains roughly 24 grams of saturated fat. With this high fat content, raw coconut meat is also a very high-calorie food, with 283 calories per cup, says the USDA. Given these high fat-gram and calorie counts, raw coconut could lead to weight gain if eaten regularly. Some publicity has discussed coconut as a veritable health food. Coconut devotees have touted the tropical treat as a rich source of "good" fat and other nutrients, able to provide energy and dubbing it "nature's sport's drink," according to Dr. Glenn D. Braunstein of Mt. Sinai Medical Center. While evidence for these claims is lacking, Harvard Medical School notes that tropical oils such as that harvested from coconuts are fine in moderation and are healthier than trans fats. The bottom line: raw coconut is high in fat and calories, and any high-calorie food can lead to weight and fat gain if not factored into your overall daily calorie intake and physical activity regimen. Although coconut contains some nutrients and small amounts of unsaturated fat, it is generally considered a food that should be enjoyed in moderation, especially if you are trying to lose or maintain your weight. Huffington Post: Glenn D. Braunstein, M.D. : Coconuts and Nuts: Are They the 'Superfoods' Some Crack Them Up to Be?